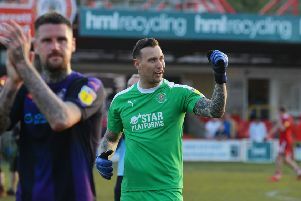 Hatters midfielder Luke Gambin was thrilled to finally celebrate victory in a Malta shirt at the eighth time of asking last week. The 24-year-old was part of the side who defeated Ukraine 1-0 in a friendly in Austria, coming on for the second half to win cap number eight. Everyone was in high spirits as it’s always good to go into the competitive game next with a good result. It was not just Gambin’s debut taste of success, but also Malta’s first since June 8, 2015 ending a winless run of 16 games thanks to Zach Muscat’s 14th minute strike. Gambin said: “We knew they were going to be obviously a strong side. “(Andriy) Shevchenko’s the manager, so he had them set up very well and it was a good win for us, 1-0. “I came on in the second half, enjoyed the game and then after we won, we were straight into preparing for Slovenia. From beating Ukraine, a team ranked 37th in the FIFA rankings to Malta’s 182, Gambin and his team-mates then flew to Ljubljana’s Stozice Stadium to take on Slovenia, in a World Cup Group F qualifier. However, Josip Iličić’s superb curling effort in first half stoppage time and Milivoje Novakovič’s strike were enough for a 2-0 win for the hosts, ranked 56th in the world themselves. Gambin said: “We knew they were going to have a bit more quality and we prepared right, we did everything we could. “The stadium was beautiful to play in, but we were calm, went into it well prepared and really enjoyed it. “Ilicic caught my eye, he plays for Fiorentina, a striker and they’re a very attacking team. “Obviously playing Malta, they know what they’re going to get from us, so they came out full of attack. Gambin once again had to make do with a place on the bench, coming on for Bjorn Kristensen at the interval to win his ninth cap. He said: “I was hoping for 90 minutes but I joined the team a bit later, so I just had to prepare myself right and take my chance when it came. “I came on in the second half, did well, but obviously it wasn’t enough to get a win. “The team had already done a week before me and the Maltese based boys, they were straight from their season into getting into training with the national team. “So they put me on a shorter based schedule, but the sports scientist out there is really good, he helped me through. “It’s very intense and we work very hard on our defensive shape and keeping compact. “But at that level, scoring goals is the hardest part of the game. After beating Ukraine, coach Pietro Ghedin said: “I’m very happy because the performance was very good. “I’m very satisfied about the performance of the team.